To view schedule, team rankings and heat draws for September 20, click here. The Gold Medal assures Muñiz a spot in the Lima 2019 Pan Am Games, which will award a qualification position for a man and woman in the Tokyo 2020 Olympics. 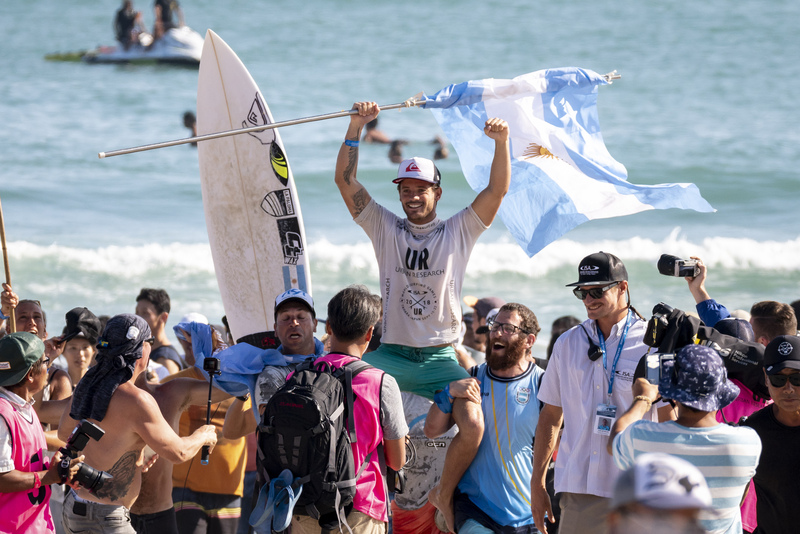 Muñiz’s performance continues a surge in strong Argentinian Surfing, with the country having taken the Men’s Gold Medal four times in the last eight editions of the WSG after Leandro Usuna’s dual Gold Medals in 2014 and 2016. Teammate Ignacio Gundesen is the current ISA World Junior Champion. “I am so happy. This feels like a dream,” said Muñiz. “It’s amazing to represent my country. I can feel the energy coming from my team. It’s a beautiful feeling! Following Muñiz in Pan Am qualification and a chance for Olympic qualification were Peru’s Bronze Medalist Lucca Mesinas, who filled one of the two slots reserved for the host nation, and USA’s Kevin Schulz, who finished fifth overall and took the second slot for the top finishing surfers in the event. Japan’s Kanoa Igarashi and Shun Murakami doubled down on history for Japanese Surfing, respectively earning the Silver and Copper Medals for the host nation. In Igarashi’s and Murakami’s first appearances in the event, both earned the first WSG medals for Team Japan in the event’s 54-year history. The powerful performance displayed by the Japanese delegation demonstrates the leaps and bounds taken in increased level of Japanese surfing in recent years, particularly since the inclusion of Surfing in the Olympic Games. Heading into the final stretch of the competition, the young contingent of Team USA holds the lead in the team rankings, with all three of their women surfers remaining in the event. Ranging from 12 to 18 years old, USA’s young trio in the women division put on a stellar performance, as Summer Macedo, Zoe McDougall, and 12-year-old phenom Caitlin Simmers all advanced through the day of Repechage Rounds. Simmers is becoming one of the surprising stories of the event, showing a level of talent well beyond her years and defeating experienced surfers more than twice her age in the process. Team Australia also sits in a strong position heading into the Women’s heats, trailing USA by a mere 430 potential points. Australia has three surfers remaining in the event, two of whom have qualified for the Main Event Final. Sally Fitzgibbons and Holly Wawn of Team Australia will face off against South Africa’s Bianca Buitendag and New Zealand’s Paige Hareb in the Main Event Final when competition resumes. Australia’s advantage over USA is that they already have two surfers in the Main Event Final, whereas all USA surfers are in the Repechage and will inevitably have to eliminate a teammate if they are all to advance. However, Australia will need to make up the 430-point difference that separates them from USA after the Men’s Division points were all awarded. “Santiago Muñiz put on an incredible performance in the entire event, showing how far Surfing has come in Argentina. We have come a long way since the 1970’s, when the military dictatorship banned surfing in my native Mar del Plata, in Argentina. It is amazing to see how the talent has blossomed to a world-class level. 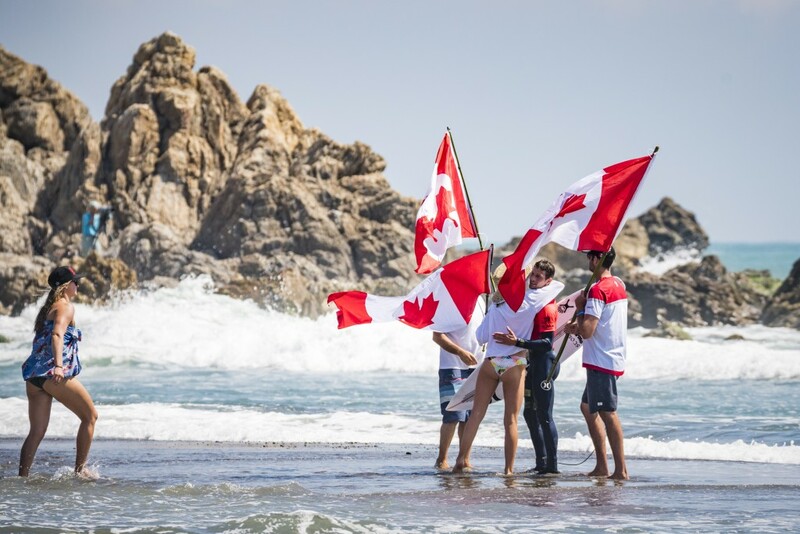 “Today we also witnessed three surfers qualify for the Lima 2019 Pan Am Games, where these three young men will get a chance to earn a spot in the Tokyo 2020 Olympics. Later this week we will see which women will join them in Lima for this amazing opportunity next year. “This edition of the event is also of great importance because it is the first with equal slots for men and women, therefore awarding equal points for each gender for the Team World Championship. The women will have as much weight in the team points ranking as the men, which reflects our commitment to continue promoting gender equality across the sport.